This surveying instrument is made up of a circular plate bearing a Latin inscription along its circumference which explains that it is used 'for operations of Geography, Chorography and Cartography'. The operations of the instrument are finely illustrated in an engraving which occupies the upper half of the plate, where people can be seen carrying out measurements in a rural landscape. 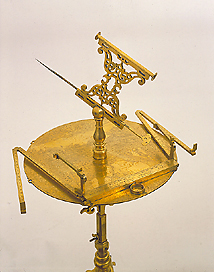 The instrument is signed and dated 1557, and was used to measure distances and heights, to calculate topographical relief and to carry out perspectival drawings.